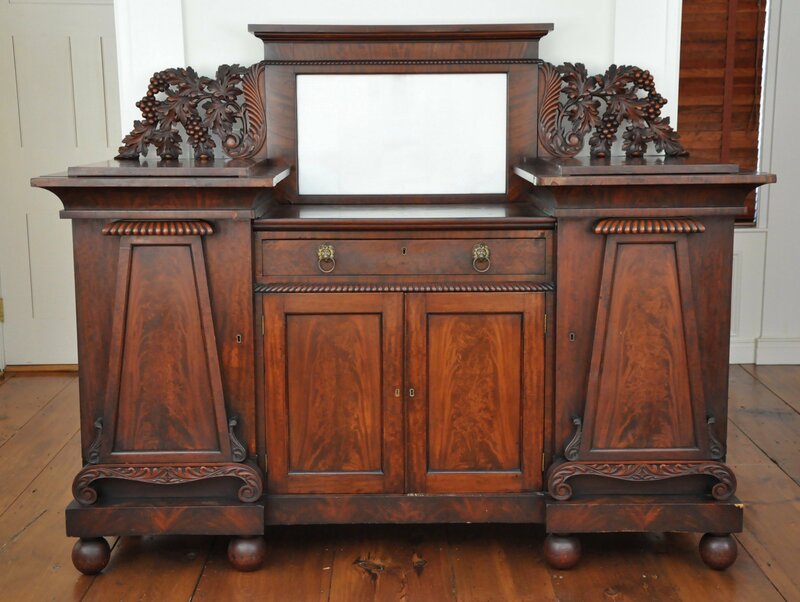 This handsome sideboard exhibits details associated with the Egyptian Revival taste making it a rare form in American Classical furniture. The mirrored backsplash with an overhanging cornice and a gadrooned molding is flanked by beautiful pierced carvings of grape clusters and leaves. Concealed drawers are placed over end pedestals with pylon shaped doors that are topped with large gadrooning and accented by scrolling leaves. The drop well is covered in book matched crotch mahogany veneers. A concealed pullout slide is finished in its original polychromed stipled oilcloth. Below the slide, a drawer is placed above two doors exhibiting choice mahogany veneers. The entire case is supported by a conforming plinth resting on ball feet. Related examples are part of the collections of the Saint Louis Art Museum and the Chicago Art Institute.